WE ARE FORTUNATE in Quincy to not deal with a lot of traffic issues. I could never live again in the big city - I'm too used to driving "all the way across town," a grueling 10-minute commute. I get nervous when I'm stuck behind three cars at a four-way stop. I am walking to the store this morning and it will take me 15 minutes. So I'm not happy at hearing the Memorial Bridge will be closed for three months this summer. Three months? Really? Click here for WGEM's story - Jeff Schuecking and I were interviewed Thursday. Memorial Bridge is almost 90 years old. I understand it has issues. Our entire country has infrastructure issues. But does it really take three months to fix this thing? I don't understand. I guess I'm just one of the poorly uneducated The Donald loves. And it's good to be loved. 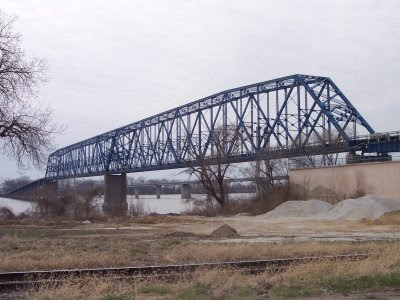 First of all, we are lucky to have two bridges crossing the Mighty Mississippi. The newer Bayview Bridge takes us to Missouri and the land of fewer taxes, and the Memorial Bridge brings us back. A ton of people from Iowa and Missouri use the bridges every day, both to visit and for work. It's nice to have two lanes and one-way traffic. But this summer, you'll see traffic snarled for sure because it only takes one idiot to not pay attention and cause a crash or an issue on the bridge. Sure, gas is 10 cents cheaper in Missouri and the cigars are better and cheaper, too. But since Hy-Vee started its Fuel Saver program, I never buy gas in West Quincy anymore. This will put a hurt on my love of cheap stogies, though. More importantly, it will kill the traffic coming up Maine Street from the Memorial Bridge. You know, the traffic that sees Second String Music at Fifth and Maine. Almost every day we have somebody come in, usually from Iowa or Missouri, and say, "I saw your sign and I had to stop." Now they will be coming in on Broadway and unless alerted, will sail on up into the Great Big Box Abyss and completely bypass downtown Quincy. Word of mouth will hopefully tell folks about us. Take a right on Fifth and go three blocks up to the park. Please. PLEASE. We are begging you, please. This country is great at building things. We are lousy at maintaining them. There has already been talk of putting up a new bridge. Uh .... how about sooner than later? What? It would cost how much to build a new bridge? Fix my elevator at Fifth and Maine while you are at it, would ya? There is actually a website devoted to the Memorial Bridge replacement. It contains the dreaded phrase, "Bridge Focus Group." In other words, a government agency is responsible and it will take a long, long time to get done. But that's OK - they've started. I think. Apparently the new bridge in Merodosia is costing $55 million to build. I shudder to think what a new bridge here will cost. But then again, we shudder a lot when it comes to infrastructure, focus groups and people avoiding downtown Quincy. It's going to be a long summer. I just hope we can keep people cruising up Maine Street.